Ever feel like you can’t keep up with all your child’s apps and online activity? According to millennial expert Ana Homayoun, you are not alone. 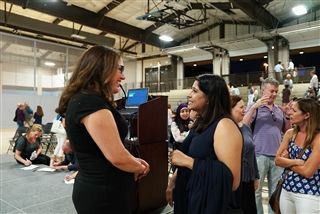 On September 13, Ms. Homayoun gave parents a primer on today’s digital landscape and provided advice for parents to help their children manage their online lives. Her top three suggestions? Know what apps your child is using, take phones out of the bedroom at night, and develop a family agreement on technology use. Check your email soon for follow-up resources from Mr. Michel and Ms. Molineaux. Ms. Homayoun’s book, Social Media Wellness, can be purchased here.